Hornfels can have any of a wide diversity of microscopic minerals, all too small to see or identify without thinsection and a specialized microscope. Hornfels is a nondescript rock which varies widely in appearance. 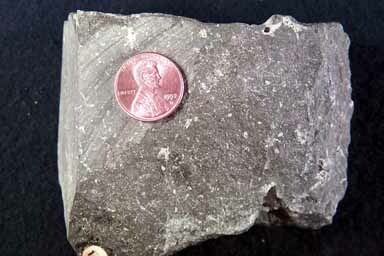 This specimen is typical, a dark gray to black,dense, hard, compact, massive rock breaking with conchoidal fracture into sharp angular pieces. It is harder than glass and has a dull luster. Be cautions; variations on this, especially color, are common - as well as confusion with similar looking rocks, such as basalt. Hornfels results from the contact metamorphism of shales or other clay rich rocks in the viscinity of an igneous intrusion. As a result they have no specific tectonic association or meaning. They can form just about anywhere.